One of the features of VStar is that it is set up so that you, the user, can think up new and interesting new ways to use the basic program. You can do this by creating your own plug-in or by using ones that others have created to extend the power of VStar. If you are interested in creating your own, please read the documentation on how to do this. If you would like to see some plug-ins that others have created, you have come to the right place. This page contains a list of VStar plug-ins which we feel might be of use to you. If you are looking for general information about VStar or would like to find out how to get it, please go to the the VStar overview and download page. If you install or update a plug-in, you will have to close VStar then re-open it for the plug-in to become available. You may adjust some of your settings for the Plug-in Manager (the file path and whether or not you wish for your plug-ins to load automatically) by clicking on the "File" and "Preferences..." menu items, then selecting the "Plug-in Settings" tab. Please note that prior to VStar version 2.16.0 it was necessary to download and install each plug-in manually. It is not recommended that you use this method anymore, but if you still wish to install your plug-ins manually, here is how it can be done. Description: This plugin will allow you to open files that are either in the "AAVSO Extended File Format" or "AAVSO Visual File Format". It is hoped that this will be useful to anyone wishing to view, analyze, or check their own data files. It is also the same format as that exported from VPHOT. Please note that this plugin accepts files with dates given in either JD or HJD. 1. Search for a star, then click on its name to get details. 2. Scroll down to the "External Links" section and select "ASAS light curve" from the drop-down list. Click "Go". 3. Click the "GetData" button to view the data used, then copy and paste that into a text file. 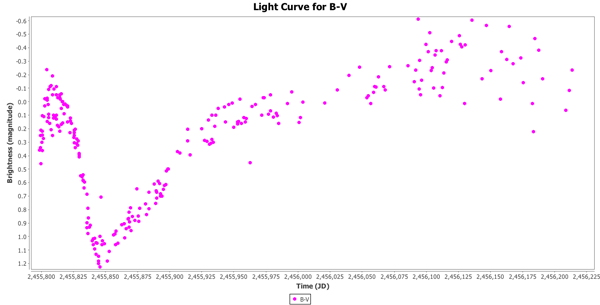 Description: This plugin can be used to add a B-V plot to any lightcurve containing Johnson B and V observations. It will look for B and V observations that are within a certain interval of time apart (you can specify the tolerance) then add a datapoint with the B-V value as a new series. You can then treat it like any other series or band in VStar. Open the "Plug-in Manager" in the "Tool" menu and install the "B-V series creator". Close VStar and re-open it again in order for the plugin to take effect. 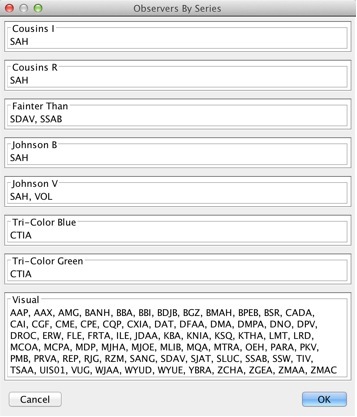 Description: This is a VStar observation source plug-in which reads DASCH (Digital Access to a Sky Century @ Harvard) data from an input file in tab-delimited "Starbase table" (.txt) format. See bugs-and-features #439 on SourceForge for VStar. More information is available at http://dasch.rc.fas.harvard.edu/lightcurve.php. 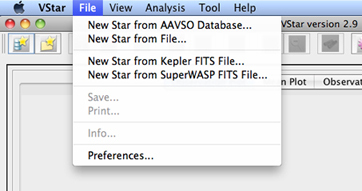 To use this plugin, select “New Star from DASCH file …” from the File menu. The initial plot is somewhat distorted along the Y-axis by very large error bars - select Plot Control from the View menu and un-check the “Excluded” box in Visibility of Data. 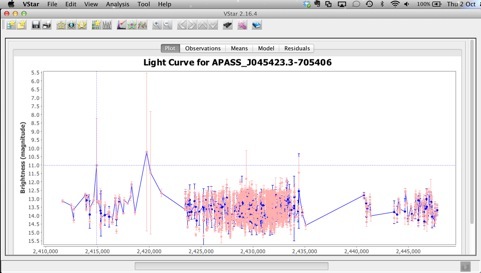 Description: This plugin allows you to read light curve data for any of the Gaia DR2 stars that were identified by Gaia processing as variable and therefore have photometry available. Data are accessed directly from the Gaia web service. The passbands can either be the Gaia red (RP), green (G) and blue (BP) or they can be transformed to V, Rc, Ic. Description: This plugin will allow you to read Hipparcos/Tycho Catalogue Data in the format exemplified at http://www.rssd.esa.int/hipparcos_scripts/HIPcatalogueSearch.pl?hipepId=76343 for star HIP 76343 … It can read the data either as a URL or a local file. The Hipparcos Variable Stars page describes some prototypical stars measured by Hipparcos, together with their HIP numbers. To find the data for a star, construct a URL like the one above replacing “76343” with the HIP number of interest. To find the HIP number for a star, check out the SIMBAD source name resolver. 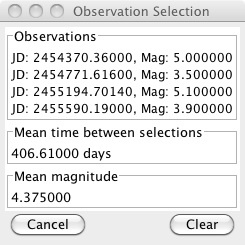 Please note that Hipparcos makes use of the Barycentric Julian Date (BJD). For more information see the Hipparcos Catalogue: Epoch Photometry Annex (page 220). Description: This plugin will allow you to import FITS file format (Version 2.0) data from the NASA Kepler and K2 Science Center into VStar. 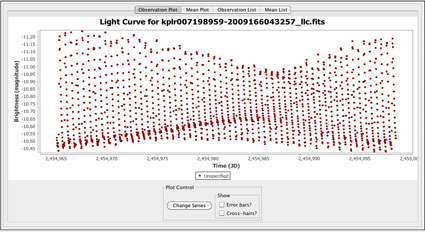 Sample Data: kplr_RRLyr.fits (168K) - Click here to get the form for downloading Kepler data. Notes: To use this plug-in you must also download tamfits.jar (131K) and place it in your vstar_plugin_libs folder in your home directory. The code was developed using the Topcat FITS library. For an example on how to download and use Kepler data in VStar see this post from David Benn's blog. Documentation: Instructions for using this plugin can be found here (1.3MB PDF written by Brad Walter and Cliff Kotnik). Description: This plugin will allow you to import FITS file format data from the SuperWASP program into VStar. Notes: To use this plug-in you must also download tamfits.jar (168K) and place it in your vstar_plugin_libs folder in your home directory. The code was developed using the Topcat FITS library. Updated version includes CCD X, Y, flux, and fluxerr. 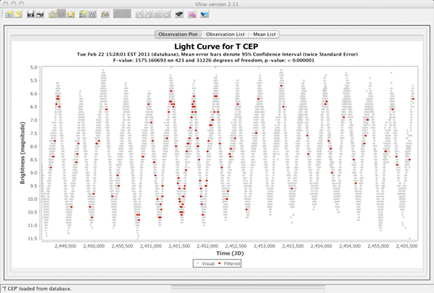 Description: This plugin will compute the absolute magnitude and distance to a Cepheid variable based on the Period-Luminosity relationship. You can input the average apparent magnitude and the period to the equation. Documentation: Instructions for using this plugin can be found here (340KB PDF written by Barbara Harris). Please note that this plugin now appears as "Leavitt's Law distance calculator..." in VStar's Tool menu. Description: This plugin will give you the calendar date for any JD you type in. 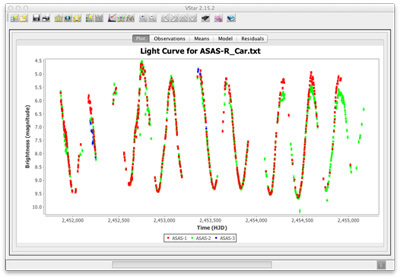 Description: The Current Mode ANOVA plug-in allows the ANOVA (One-way Analysis of Variance) algorithm to be applied to a loaded set of observations in raw or phase plot mode. Description: This plugin will record the mean JD and magnitude between selections you make on the plot. Description: This plugin will allow you to display, for each loaded series, the observer codes of all observers who have contributed observations to that series. To use the plugin, select “Observers by Series...” from the Tool menu. Description: A filter tool plugin that will allow the user to enter a group of observer codes so that they can be highlighted. Ideal for showing the contributed observations from a particular club or group of people. Description: The AoV plug-in implements a period search algorithm. Whereas Date Compensated Discrete Fourier Transform (DCDFT) uses Fourier Analysis to search over a period range given a loaded set of observations, AoV uses the ANOVA (One-way Analysis of Variance) algorithm to create a periodogram, a plot of period vs power. Description: This plugin creates a locally weighted scatterplot smoothing fit of the specified series. See http://en.wikipedia.org/wiki/Local_regression for more information about the algorithm. 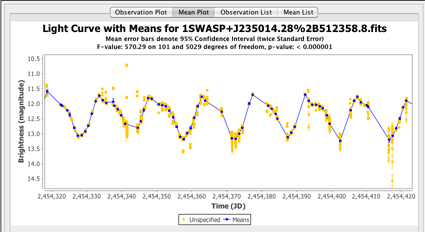 The Loess interpolator in the Apache Commons Math library (already used by VStar to implement ANOVA) is used. Description: Takes as input a series of observations and creates a model based upon one or more user-specified periods and one or more harmonics per period. If you would like to write your own plug-in, some documentation can be found here. View the source code for the plug-ins created by David Benn. Discuss techniques and results of data analysis on the Data Analysis Forum. For general help with VStar, please post your questions or comments on the VStar Forum.